Apart from one friend who has a major aversion to onions, I think most people would agree that a bowl of steaming hot French onion soup is heartwarming and delicious, especially at this time of year. The shot of brandy helps. There are many versions of this classic soup; some call for chicken broth (vegetarians will use vegetable broth); some versions call for sherry rather than cognac; some have a plain crouton on the bottom as well as the cheese-covered one on top – and I’ve ordered it in supposedly good restaurants only to find some alternative, gluey and less aromatic cheese has been used in place of the traditional Gruyère. Worse, it’s frequently presented with the entire top and sides of the bowl dripping with an excessive rubbery blanket of palate-scorching melted cheese. Which brings me to this point; I prefer not to scald the lining of my mouth, so I like to place the Gruyère -topped crouton at the bottom of the bowl and pour the hot soup over it…rest assured, the cheese will melt. Melt the butter and olive oil in a large pan over medium heat. Add the onions, and the sprig of fresh thyme – stir well to coat all the onions, turn the heat down to very low and cook, stirring occasionally until they’re caramelized, golden and meltingly soft. This can take up to an hour. Crank up the heat and pour in the cognac. Stir for several minutes until it has mostly evaporated then add the wine and continue to cook until the liquid has reduced to a syrupy consistency – approx 6-8 minutes. Pour in the broth and reduce the heat to medium-low. Simmer for 20-30 minutes. Allowing two slices per serving that will fit the top of each soup bowl; toast the slices of baguette and preheat the broiler. 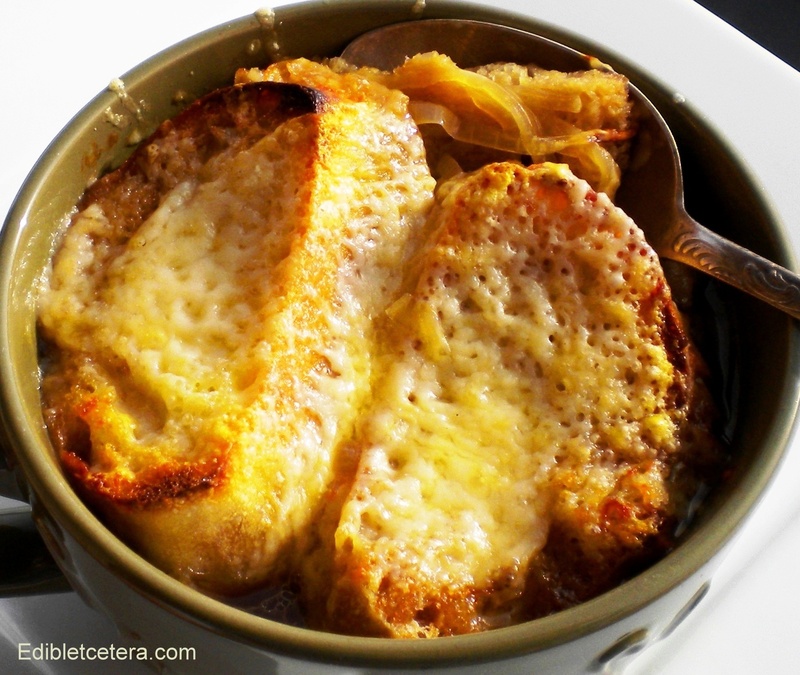 To serve – leaving enough room for the croutons, divide the hot soup evenly into oven-safe soup bowls, place the baguette slices on top, scatter with the Gruyère and stick under a hot grill/broiler until the bread is nicely browned and the cheese is bubbling. I want a bowl of this right now! Can’t wait to make this.